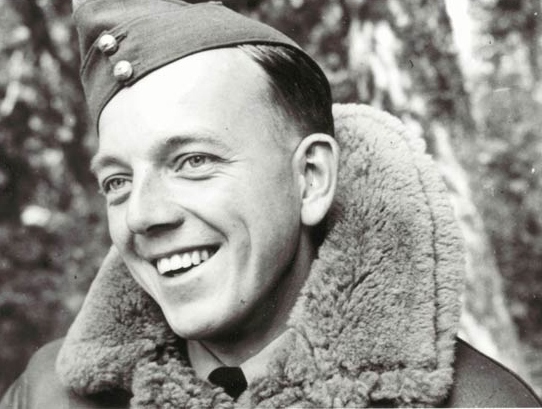 Shot Down in the Battle of Britain. 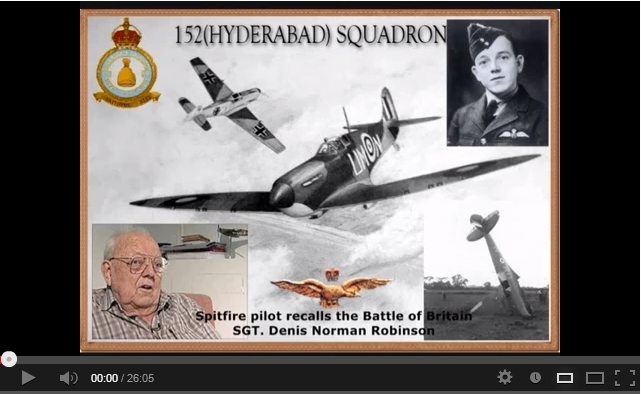 It happened during the Battle of Britain on 8 August 1940. By this time I had destroyed a ME 109 on 25 July and destroyed another on 5 August, but now it was my turn to be shot down by ME 109s of II/JG 53 (Ace of Spades) off Swanage in Spitfire K9894. The facts are not particularly gratifying for either myself or Pilot Officer Beaumont, who was also shot down with me that day. We were returning from a patrol in which we had intercepted the enemy and had used all our ammunition. Our eight Browning machine guns used ammo fast due to the limited storage space in the Spitfire wings, and there was never more than 15 seconds total fire power available. So we were returning to our base at Warmwell to refuel and re-arm. There were three of us flying in vic formation with Beaumont on the left of the flight leader and myself on the right. We were flying in very tight formation, probably about a foot from the leader's wingtips. Therefore Beaumont and I had our eyes and concentration firmly fixed on the leader's aircraft. This was the way we flew in close formation early in the battle - until we learnt better later. Unfortunately, a group of ME 109s spotted us and carried out an attack on our unprotected rear, which we had offered them on a plate. We ought to have known better. We knew that it was vital to keep a good lookout at all times, but were lulled into a false sense of security and had relaxed our vigilance briefly. After all, we had had our scrap, were nearly safely home and, anyway, we had no ammo. The first thing I felt was the thud of bullets hitting my aircraft and a long line of tracer bullets streaming out ahead of my Spitfire. In a reflex action I slammed the stick forward as far as it would go. For a brief second my Spitfire stood on its nose and I was looking straight down at Mother Earth, thousands of feet below. Thank God my Sutton harness was good and tight. I could feel the straps biting into my flesh as I entered the vertical with airspeed building up alarmingly. I felt fear mounting. Sweating, mouth dry and near panic. No ammo and an attacker right on my tail. All this happened in seconds, but now the airspeed was nearly off the clock. I simply had to pull out and start looking for the enemy. That's what I did, turning and climbing at the same time. As I opened the throttle fully, with emergency boost selected to assist the climb, I noticed wisps of white smoke coming from the nose of my fighter. God, no! Fire! Suddenly the engine stopped. Apparently a bullet in the glycol tank had dispersed all the coolant and even the faithful Merlin could not stand that for long at full power. So that explained the white smoke. Blessed relief. The fuel tanks of high octane fuel are situated very close to the pilot in a Spitfire. The dread of being burnt to death was one of the worst fears. It drew heavily on any reserves of courage one had. You can imagine by now, my eyes are searching wildly, frantically looking for my adversary - but, as often happens in air combat, not a single plane was to be seen in the sky around me. The release of tension as I realised my good fortune is something that cannot be described. You only know what it is like to be given back your life if you have been through that experience. The problems that still confronted me, sitting in the cockpit of a battle-damaged Spitfire, seemed almost trivial in comparison with my situation of a few seconds before. I experienced this feeling several times during the Battle and it had a profound effect on me, which remains with me to this day. It somehow changed my value system, so that things that had seemed important before never had the same degree of importance again. Maybe this is what generated the anti-authority behaviour amongst us. 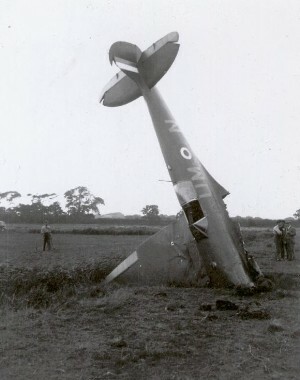 It was no good telling us not to do a victory roll over the airfield when we returned from a scrap, because our aircraft may be damaged and might end up like strawberry jam in the middle of the field. This seemed a trivial risk compared with our experiences of combat in battle. To bail out, or not? The end of the episode was something of an anticlimax. I still had plenty of altitude and time to think. I prepared to bail out and began going through the procedure in my mind. Release the Sutton harness, make sure all connections to flying helmet are free, slide the canopy back, roll the aircraft until inverted, push the stick forward and out you go. Then start counting before pulling the D-ring. How many? My memory went blank. Was it three or ten? God! There is a vast difference between the two, I thought. Well, as long as the interval is sufficient to get clear of the aircraft before pulling the D-ring it should be OK.
During this soliloquy I'd got the Spit into a steady glide. It was gliding rather like a brick, but handling reasonably well and responding to the controls almost normally. I surveyed what I could see of the damage from the cockpit. Not much, apart from a few bullet holes here and there, particularly in the starboard wing. It worried me to abandon the old bus to certain destruction on to heaven knows what, perhaps a school full of children. Besides, I was by no means convinced that the bailout procedure I had rehearsed was not without considerable risk. I could get caught up in the cockpit paraphernalia... I might be struck by the tail plane... or what if the parachute didn't open? No. I convinced myself that was b.... dangerous. I would stay with her and force land in a suitable field. By now most of the fields looked pretty small, so I decided it would be with the wheels up. I picked a field near Wareham that looked suitable, slid back the canopy and commenced an approach. At about 200 feet the boundary loomed up. Full flap and a flare out near the ground achieved a creditable touchdown. So far so good. I was quite pleased with myself as the Spit slithered across the grass. Then suddenly, I felt her going up onto her nose and, I thought, onto her back. With an almighty crash the canopy slammed shut over my head, the cockpit filled with dirt, completely blinding me. The aircraft seemed to me to be upside down and I was trapped. That awful fear of burning returned at full strength. I grabbed the canopy with all my might and threw it backwards. To my utter amazement it shot back easily, and the excessive adrenaline-boosted force I had used nearly tore my arms from their sockets. Now I could see that the aircraft had finished up vertically on its nose, in a ditch I hadn't seen from the air. My actions now became somewhat comic. It was obvious that I could easily jump clear and I commenced to do so without much hesitation. To my utter horror I couldn't move. Suddenly, I realised I was struggling against the Sutton harness, still buckled firmly in place. An instant pull released the pin. I was free. As I stood up to jump my head was jerked violently backwards. This time it was my flying helmet, still attached to the radio and oxygen sockets in the cockpit. Removing this final impediment I jumped to the ground, leaving my helmet in the cockpit. To my surprise the Spitfire didn't burn. I stood back and took in the scene as locals arrived to convey me off to a pub in nearby Wareham and fill me with whisky. I had a slight bullet graze on my leg, but was otherwise unhurt and felt strangely elated. Next day I was back on ops again. Later my thoughts turned to my actions at the time and to my survival. Firstly, I must have sensed without fully realising it that the tracer from the enemy fire was coming from left to right direction. Since I was on the right of the section leader I could not turn left and collide with him. The only way to go was a right turn, which would enable the attacker to tighten his turn and would have made me an easy target. The instant reaction of stick hard forward causing the Merlin engine to belch smoke from the exhausts may have convinced the ME 109 pilot that he had been successful in his attack, or perhaps the sudden change in attitude of my aircraft caused the attacker to overshoot his target. Also, the ME 109s operating over the Dorset coast far from their French bases were short of fuel and couldn't hang around at length in a dogfight or chase situation. It would have been nice for us if we had known this fuel problem at the time, but we did not. I only found this out years later, after the war. To this day I still do not know what gave me that sixth sense and instant reaction to jam the stick hard forward. Telling this story helps me to deal with my survival syndrome. In a difficult-to-describe way, it is as though I am speaking for the other chaps who did not make it. Their final story would have been infinitely more readable than mine. One constantly asks: 'Why did I survive ... why did others not?